#ROHobsidiantriple loved seeing the triple bill tonight. Obsidian Tear made me think hard about the relationship between music and dance. What did you think of Obsidian Tear / Marguerite and Armand / Elite Syncopations? Obsidian Tear / Marguerite and Armand / Elite Syncopations runs until 11 May. Tickets are still available. Obsidian Tear is a co-production between The Royal Ballet and Boston Ballet and is staged with generous philanthropic support from Linda and Philip Harley, Victoria Robey and an anonymous donor. Elite Syncopations is staged with generous philanthropic support from Lindsay and Sarah Tomlinson, Richard and Delia Baker and Peter Lloyd. 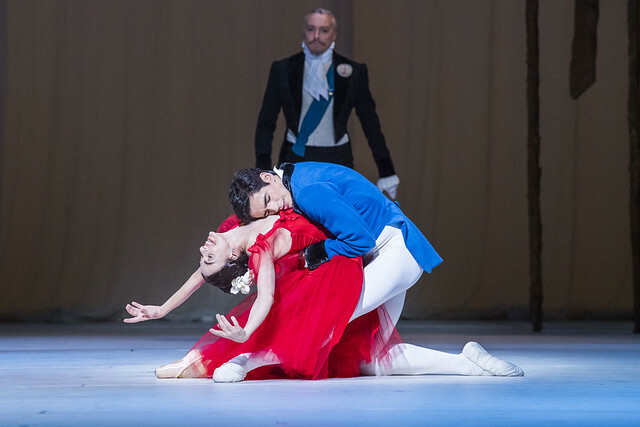 A slightly odd combination of ballets, though similar programmes are often found in recitals of classical music, and I did not find it too jarring. My highlight was Alessandra Ferri's spectacular performance in Marguerite and Armand, a ballet that is close to my heart. Federico Bonelli was an excellent partner. I found Obsidian Tear intriguing, though the costumes looked as if someone was parodying Wayne McGregor's personal dress sense. Elite Syncopations - well, a bit of fun, with a very alluring Sarah Lamb. Not very keen on Obsidian Tear, despite reading the programme notes avidly to maximise my understanding. I liked the music of the 'Nyx' Symphonic Poem by Salonen - pity it didn't seem to go with the dancing! M & A was great (as ever), particularly impressed with Matthew Ball - a star in the making. Elite Syncopations great fun as expected. Appreciated the effort and talent of the dancers in Obsidian Tear but did not enjoy this ballet. I was really there (25 April) to see Lauren Cuthbertson and Matthew Ball in Marguerite and Armand and was totally emotionally involved in their performance. I wish I could see it again. A complete change of mood after the interval - smiles all round - love Elite Syncopations. What a great evening. Ferri made me cry in her performance as Marguerite. She is such a fantastic actress and technically very good despite her age. Bonelli was a perfect partner to her such that you could feel the chemistry between them. Obsidian Tear is a good but enigmatic ballet and is one by McGregor that is worth repeating in the future.The programme finishes on a lighter note with McMillan's Elite Syncopations in which Sarah Lamb, an excellent dancer, gave a stunning performance. An excellent triple bill in which all three ballets did credit to the company. Nella and Vadim were outstanding as Marguerite and Amande. Absolutely compelling, beautiful and tragic. It's amazing how the essential points of a full length opera can be made through dance in 34 minutes. A triumph. Elite Syncopations sent us all on our merry way into the night. All dancers were brilliant, but special enjoyment was provided by Beatriz Stix-Brunell for whom the white lady part might almost have been designed, it so suits her personality. Melissa Hamilton and Paul Kay gave a witty interlude of great skill as did Itziar in Calliope. As for Obsidian Tear: I praise the efforts of the dancers, but why bother? I wouldn't be concerned if it were lost forever. Too much effort, too long and as far as I could see, pointless. Apologies to the magnificent dancers (and violinist): it wasn't their fault. We appreciated the effort and energy by the dancers in Obsidian Tear but could not wait for it to end ! Then we were in heaven with the wonderful and tragic Marguerite and Amanda together with such a different offering in the fun of Elite Syncopations. A diverse programme and although we try to broaden our horizons we do not want to see Obsidian Tear ever again. As said above , apologies to the dancers and violinist but it was not their fault. I loved every minute of this amazing triple bill last night. I do find the diversity of a ‘mixed’ programme incredibly rewarding! Musically alone, this was a very stimulating and rewarding programme, to say nothing of the dancing, which was simply extraordinary! I paid £14 for my ticket!! Such value!!! My only grumble: why do we need TWO 30minute intervals?? With long curtain calls after each ballet I missed my train and ended up in a horrible “cancellation” situation and was very late home. Surely 20mins between each ballet should be enough?? Marguerite and Armand in the hands of Nunez and Muntagirov was simply wonderful. Their every emotion was expressed through dance. it took my breath away. PLEASE stage Elite Syncopations again as soon as possible, especially if you tour with it, and especially to Plymouth. I am 90 and would like to see it once more.